We are honored to have Michel visit our campus and share his rich heritage about his great grandfather Auguste Escoffier; internationally recognized as perhaps the most famous chef in history, said Boulder Campus President, Kirk T. Bachmann. 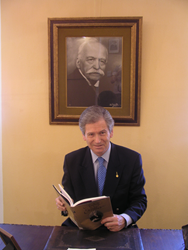 The Auguste Escoffier School of Culinary Arts located at 637 South Broadway welcomes Michel Escoffier, the great grandson of Master Chef Auguste Escoffier and president of the Escoffier Museum and Foundation in Villanueve - Loubet, France which is affiliated with the school to Boulder. Escoffier, who is a distinguished member of the school’s advisory board will serve as an honorary judge at the school’s “Young Escoffier” High School cooking challenge on March 7th at the Renaissance Hotel and will preside over the induction of local professionals into the prestigious Disciples d’Escoffier – a premier International culinary society on March 8th at Rembrandt Yard. “We are honored to have Michel visit our campus and share his rich heritage with our students, staff, employers and farm partners about his great grandfather Auguste Escoffier; internationally recognized as perhaps the most famous chef in history,” said Kirk T. Bachmann, Campus President of the Auguste Escoffier School of Culinary Arts. Approximately 20 student teams from across Colorado will compete in the “Young Escoffier” Market Basket competition for the opportunity to be awarded with valuable culinary scholarships as well as learn more about the school’s innovative culinary and pastry programs including its highly popular Farm To Table® Experience. During the competition, students will have the unique opportunity to interview Mr. Escoffier. With more than 20,000 members worldwide, the Disciples d’Escoffier organization honors the memory of Auguste Escoffier, promotes and preserves his work and promotes culinary education and apprenticeships encouraging people to discover the desire and motivation to work as professional chefs. Incoming Boulder professionals to be inducted include Bertrand Bouquin, Executive Chef of the Broadmoor; Mary Jarrett, Editor-in-Chief of Boulder Magazine; Antonio Laudisio, Owner of Laudisio Mobile Catering; Ashlea Tobeck, Executive Chef and Instructor at the Auguste Escoffier School of Culinary Arts Boulder; and Daniel F. Widmann, Pastry Chef and Instructor at the Auguste Escoffier School of Culinary Arts Boulder. To learn more about the Auguste Escoffier School of Culinary Arts, attend an upcoming open house, visit Escoffier.edu, call 877-249-0305 or follow us on facebook at http://www.facebook.com/escoffierschool. The Auguste Escoffier Schools of Culinary Arts offer professional culinary arts programs based on the methods, principles and systems of Auguste Escoffier, the international culinary icon and the source of modern cooking. Students have the opportunity to learn history and context directly from the Escoffier family, and expert chef instructors. The Disciples Escoffier International is the premier gastronomic society established in France to maintain the good name and traditions of French Cuisine. The goals of the Disciples Escoffier International are to honor the memory of Auguste Escoffier, in France and worldwide, promoting and preserving his work and maintaining the great culinary traditions; to promote culinary education and apprenticeship encouraging young people to discover the desire and motivation to work as a professional chef. The Disciples Escoffier International continues to work in close cooperation with schools, establishing contacts between professionals and students; to organize culinary events worthy of these traditions; to honor those in the culinary profession who work to maintain the high standards of French haute cuisine and to unite all Disciples Escoffier from around the world and in the true “Esprit Escoffier”. Today, there is a worldwide membership of more than 20,000 that includes a large membership in France, China, Hungary, Italy, Japan, Benelux, Canada, Mexico, Portugal, Thailand, Germany, South Africa, Morocco, Russia and the United States. It is in this spirit that the Disciples Escoffier International - USA strives to develop a national membership, establish a culinary scholarship fund and continue its charitable endeavors. Laura Nepveux, Patrick Henry Creative Promotions, Inc.